An LCD monitor is cooler than the behemoth on your desk, but is the performance and small footprint worth the price? Everyone wants an LCD monitor. 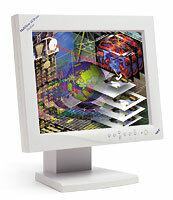 SGI's 1600 SW has a 17.3-inch viewing area and 1,600-by-1,024 resolution. It's priced at $2,384. Part of the desire comes from the fact that a liquid crystal display is the latest screen technology and that LCDs, on the outside as well as the inside, look cool. Many people want the bragging rights. But LCD monitors have real-world benefits, too, including light weight, near-zero emissions, great image quality, less eyestrain for the user and tiny footprints. Most can even be wall-mounted for a zero footprint and swiveled to the position you prefer. They also cost about twice as much as CRT monitors of similar quality. So most of the people who want an LCD monitor will go on wanting one, while making do with the big tubes on their desks. But if you have enough room in your budget to consider performance over price, there are plenty of good reasons to take a hard look at LCD monitors. LCD, or flat-panel, monitors provide a clearer picture than do most CRT, or cathode ray tube, monitors. They also are less of a strain on the eye, because the transistors assigned to each pixel on the screen produce a clear, bright picture without the flicker of CRT monitors, which are always repainting the image. NEC's LCD1510+ has a 15-inch screen, 1,024-by-768 resolution and can pivot from landscape to portrait views. It's priced at $1,300. Flat-panel monitors can stand on a desk, be mounted on a wall or moveable arm, or placed on a rack. And some of them come with features such as touch-screen capability or pivoting options, which allow you to view a document or image vertically or horizontally. The advantages of having an LCD monitor must be weighed against the cost of purchasing one in an equation that can become fairly complex. These days, there's more involved in choosing a monitor than a new PC. Office PCs are a commodity item, so choosing one is easy'select a dependable vendor and brand name, then just compare the major features and options. Buying a monitor is more subjective because after you take all the size, cost, and features into account, you still don't really know how the display will look. The FlexScan L680 from Eizo Nanao has an 18.1-inch screen and 1,280-by-1,024 resolution. It's priced at $3,035. For office applications, PC speed is simple to measure and compare. Internet access speed also is important, but it isn't something you can change by choosing a faster computer. Keyboard quality and comfort are far more important than most people realize, but even the best keyboards only cost about $100, so tossing the factory-supplied keyboard isn't a big deal. For a typical users, the size and quality of the monitor is the most important'and the most variable'factor in determining how satisfied they are with their computer. So, how do you take measure of an LCD monitor? 'Compare specifications to narrow your choices, but you must compare monitors visually before buying. 'Twenty-four-bit color is standard among LCD monitors, but lower color depth is plenty for many users and is less expensive if you can find it. 'Total cost of ownership estimates from vendors might be highly suspect when it comes to power savings. 'Giant screens are tempting, but if their resolution is low the images will appear grainy. 'Big LCD monitors are costly and unnecessary for basic word processing tasks. 'Most LCD monitors don't offer the same flexibility for graphics-intensive users that high-end CRT monitors do. Total cost of ownership is always a tricky calculation to make. SGI takes the position that purchase price is only 25 percent of TCO. You can see what the company has to say at www.sgi.com/flatpanel/qa_understanding. html#tco. 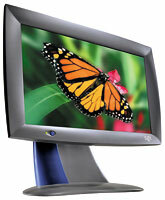 In the case of an LCD monitor, the purchase price is very high compared to a CRT monitor of similar size and resolution. The power savings gained by using an LCD can help even this out, but accurate calculations can be difficult to make. Nevertheless, accuracy is vital to comparing total cost of ownership for LCD monitors with that of traditional monitors. Raw power consumption is far less for LCD monitors, which is significant considering that during the course of a year office monitors will be on for about 2,000 hours. 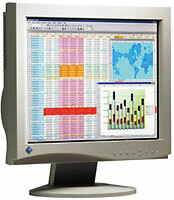 A typical 21-inch CRT monitor, such as the iiyama North America Inc. Vision Master Pro 510, uses 200 watts, or about 400 kilowatts a year. A typical 18-inch LCD panel'which has a viewing area of similar size to a 21-inch CRT'uses only 52 watts, or 100 kilowatts a year. 'At a price of 12 cents per kilowatt, the savings is about $36 per year. That's similar to the difference between buying the best small freezer and the most power-hungry model. But the price difference between the freezers is about $150. In contrast, the CRT monitor costs $1,200 and the LCD $3,200. Based on the price difference and power savings, it would take 55 years to make up the difference in total cost of ownership. That's a silly result to demonstrate how much weight you should give to some TCO calculations. SGI points out on its Web site that you also can reap significant savings from air conditioning costs, but this is where TCO calculations become very complex. As anyone with knowledge of thermodynamics can tell you, it doesn't matter how the power is used; watts consumed eventually result in heat. Running 10 200-watt CRTs is like having an electric heater running all day or two high-power quartz floodlights. In Arlington, Va., in July, this will increase air conditioning costs. But in Boston in February, it will reduce heating costs. Another variable is the fact that some buildings are so tightly closed that worker body heat makes it necessary to cool a facility even in winter, while other buildings have large heating plants. A final complication in making energy calculations relates to the fact that LCDs require less desk space, so that you can, theoretically, fit more workers into the same floor space. This lowers office costs, but increases air conditioning costs. The bottom line for TCO is that, while you should consider it, you need to look at more than just the purchase cost and energy consumption. The same monitor may be a better buy for a particular office than for one in another building, when you include energy consumption with heating, cooling and office space calculations.